Straightforward to prepare, these Asian-style pork skewers with dipping sauce are full of flavour and a great way to feed guests. Marinate the meat overnight for best results. 1. For the marinade, scrape clean the coriander root, rinse off any dirt, and chop coarsely. 2. Using a mortar and pestle, grind the root, garlic, pepper and salt into a fine paste. Combine with sugar, soy, fish sauce and oil. 3. Coat pork in marinade and refrigerate overnight. Bring to room temperature before grilling. 4. For the dipping sauce, heat tamarind purée with palm sugar, fish sauce and 3 tbsp hot water, stirring constantly. Bring to a simmer, then allow to cool. 5. Grind roasted rice using a mortar and pestle. Add this to the cooled sauce with the chilli flakes. 6. Preheat barbecue or grill pan on medium-high. Skewer the pork and cook, turning regularly, for about 6-8 minutes. 7. 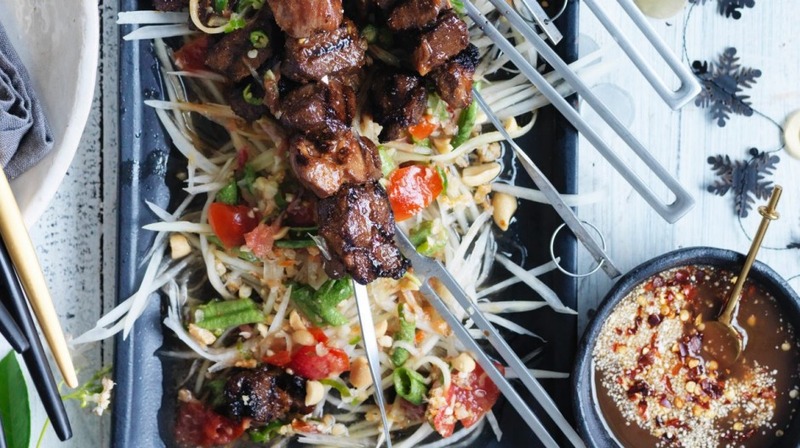 Serve immediately with sauce and papaya salad.